Millions of people are stung each year by bees, wasps, hornets and yellow jackets. These insects, all members of the HYMENOPTERA family, inject their venom into the victim. Most people react with localized swelling, redness, and itching, and these symptoms will usually disappear in a few days. Such reactions are local reactions. A severe allergic reaction can cause redness, itchiness, and hives, swelling of the lips and eyelids, difficulty in breathing, wheezing, a drop in blood pressure, shock, and unconsciousness. Symptoms may also include nausea, dizziness, stomach cramps, and diarrhea. This type of reaction is very serious and is known as anaphylaxis It can be fatal if medical attention is not obtained immediately! never walk barefoot outdoors – wear shoes with a closed toe. avoid loose hanging clothes that can trap insects between the body and clothing. avoid wearing floral patterns and blue or yellow clothing. Do not use perfumes, hairsprays, or scents of any kind which could attract these insects. Do not eat outdoors as this will attract insects and do not ingest sugared soft drinks when outdoors. If you are gardening – watch for nests in vines, trees, wood piles, shrubs, or in the ground. keep an insecticide spray in your car’s glove compartment in case an insect invades your auto while you are driving – always pull over to theside of the road, stop the car, get out of the car while using the insecticide or until the insect leaves. never participate in outdoor activities alone…hiking, swimming, boating, fishing golfing – an allergic person may need immediate help. insects are attracted to garbage, so keep all areas clean and covered. EPINEPHRINE in the form of EpiPen or Anakit should be administered as emergency treatment to the allergic person with systemic symptoms, and then the patient should be taken to the nearest hospital. In some cases, a second dose may be required. It is always best to discuss emergency treatment with your allergist before anything happens, so you are prepared for a serious reaction and know how to function in an emergency. Only the honeybee leaves its stinger in the skin, and it is necessary to remove this immediately. The sooner the stinger and sac of venom are removed, the smaller the amount of venom received by the victim. A scrape of the fingernail removes the stinger and the sac. Avoid squeezing the sac, since this only forces more venom through the stinger and into the skin. Hornets, wasps and yellow jackets do not leave a stinger, and they should be brushed from the skin promptly. Patients who are severely allergic to hymenoptera venom can take immunotherapy treatment consisting of weekly or bi-weekly injections of specific venoms. It is important to have an allergist do a complete medical history, examination, and appropriate tests to determine your sensitivity. After the initial few months of therapy, a patient can be switched to maintenance injections, which are every four to six weeks. After five years of venom treatment it has been noted that 95% of patients are protected against specific venom and if a skin test is negative, treatment may be stopped. Nevertheless, it is still recommended that these patients carry with them an emergency sting kit. Patients with an insect allergy should wear a MEDIC ALERT bracelet and carry emergency epinephrine at all times. Be sure you have been shown how to correctly administer epinephrine before you have to use it. It may not be possible to read instructions when you are undergoing a reaction. 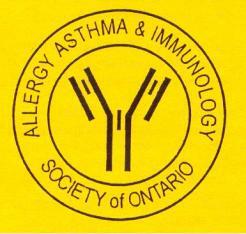 We wish to thank BAYER INC. ALLERGY PRODUCTS for support through an educational grant. INFORMATION NOTES is for information purposes only. It is not intended to replace medical diagnosis or information. It is important to consult with your physician on any health matter.